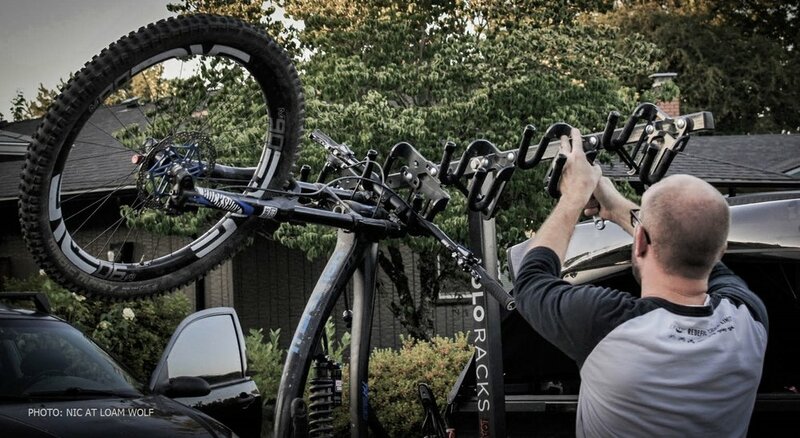 FAQ — Lolo Racks The best vertical 6 bike rack! Engineer Matt B getting ready to shred! A quick video with Jenna loading the 6 bike rack! Our design means you don’t have to lift the bikes over the rack as some other designs require. Lolo Racks are proudly cut, drilled, welded and painted by fellow riders and friends in Portland Oregon USA. Shipping weight is approximately 70 lbs. will it work with kids bikes? Yes, it works great WITHOUT need for additional special equipment. Our rack carries all of the weight through the handlebars so short bikes and kids bikes work as is. Strider and push bikes usually need a separate strap just to keep the rear from swaying. Can I open the hatch or tailgate with the bikes on? There are many variables to whether or not you’ll clear the hatch or tailgate. (bike size/length/wheelsize, hitch height from the ground, hitch placement in relation to the door) We’ve tried a hand full of vehicles but we haven’t tried every combination that could exist. We’ll do our best to give you our best guess. Why carry by the bars? We hold on to what you hold on to. This is the easiest way to carry ALL of your bikes; mountain, road, cyclocross, BMX, fat bikes, and kids bikes without changing or modifying rack parts. Bars are strong enough for a 300 pound man-beast pedaling up and down a mountain which means they are totally fine to carry a 10-45 pound bike. Other racks carry the bike by holding the fork crown or the front wheel. We feel that holding the bike by the lowest cost, easiest to replace component is the best option. Any rub marks or scuffs that might happen won't be on a $1000 component. Bike tire slow leaks and flat tires won't effect the safety of our rack. Loading point is much lower than other racks so loading is easier, faster and safer. Do I need DH hooks? You only NEED the DH hooks if you have a bike with dual crown forks (the fork tubes come all the way up to the bars) such as Rock Shox Boxxer and FOX 40s - see the photo at the top of this page. DH hooks will also work with normal mtb, bmx and road bike bars when adjusted to the narrow position. We offer the rack as a 6 bike or 4 bike configuration. Both racks are 60" wide and share the same basic mast and cross bars. The racks are drilled with both spacing patterns so you can space your bikes to suit. Mountain bikes and other flat bar bikes can be spaced fairly close together, nesting the handlebars by using the angled handlebar hooks. Our standard configuration easily fits 6 bikes. Road bikes with drop bars require wider spacing to prevent handlebar interference with adjacent bikes. We typically advise customers to fit 4 road bikes. You can carry at least 2 mtbs and 2 road bikes at the same time. If you start with a 4 pack you can move up to the 6 pack by purchasing additional hooks. Under normal operation the racks leaves no marks or marring. If you're driving for hours in gnarly, abusive, dusty conditions you may want to put a piece of extra padding or tape on the bars if you have a matte finish. You can carry bikes with fenders and panniers but you should place a pad on the rear fender or pannier if you're worried about marring the fender. We’ve spent years testing bikes with carbon bars for wear and are still testing the same bikes and bars today with no issues. can you lock the rack and bikes? We now offer the rack with a stout locking hitch bolt. Our standard rack uses a industry standard hitch bolt that is easily upgraded to a locking version if you ever want to swap it out. The rack features an integrated port for u-locks or cables. Will it work with rear mounted spare tires on my Jeep, Bronco or Rav-4? Yes the rack will work with rear mounted spares! You will set the center mast to vertical and install. Can I upgrade my rack? YES! We are not like a cell phone company and want you be happy with your purchase for a long time. We always try to design new features that can be retrofit into older models whenever possible. Cosmetic parts are also available - if you need new hook caps, bar plugs, decals or anything else let us know! Want to build your own design? We sell hooks and bike rack parts individually so you can build whatever you can dream up. Hauling 6 bikes requires strong tubes to carry the load. We only sell the rack as a 2" receiver tube because 1.25 is just not stout enough. Will you ship to Canada or the world? We don't directly offer shipping outside of the United States. We can help point you toward shipping options that other customers have successfully used. Check out shippito or bikeflights for the best rates.